I first heard about the Osmo a few years ago. It’s an extension for the ipad that includes interactive apps and games. It seemed like a cool concept, but I wasn’t sure how it would hold up practically. Was it actually a tool that encourages learning and logical thinking, or was it just a gimmicky gaming app? 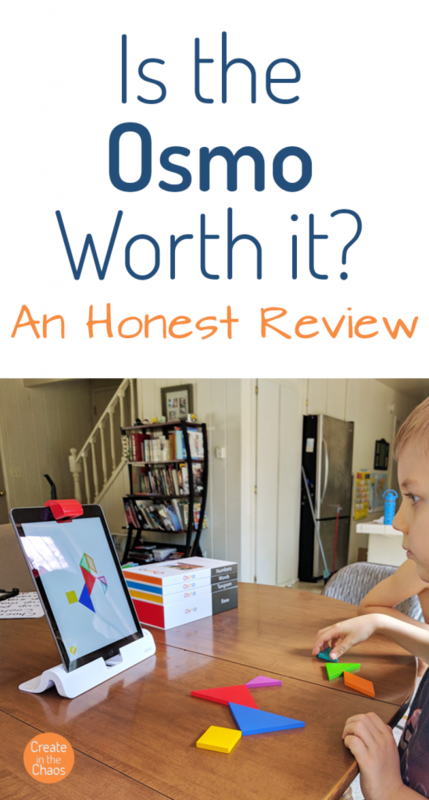 We recently had the opportunity to start using an Osmo for school, and I wanted to share some of our experience with you to help you decide if it would be a good fit for your home or classroom. I was really impressed with how well-made and durable all the Osmo parts are. While we teach our boys to treat what we own carefully, I love when something is durable and feels like it will actually hold up to normal wear and tear. The apps we loved the most were the ones that required you to really engage with both the physical part of the game as well as the screen. There is so much going on here that I love! Spatial recognition, analyzing a picture and recreating it, patterns, and more. We started on the easy level, but as you keep progressing the puzzles become more difficult and require more thinking. This was a super fun game that all three of my boys loved. It involved not just learning adding in different ways, but also planning ahead to create combos. It’s another game that progresses well with levels. Because of they were constantly adding new numbers together, it required a lot of working back and forth between the tiles and the screen. This was the game that the boys were the most excited about. And it did not disappoint! The game itself was super fun, and I loved how it made them think very logically about what they needed to do to move the monster around the map and perform actions. The difficulty progression was handled very well. The setup for the Osmo and apps was very easy. But because of the way the stand and the camera attachment works, the Osmo only works when the ipad is out of a case. We always keep my husband’s ipad in an Otterbox case to keep it safe. It has protected it from many, many drops over the years. So it makes me a little nervous to have the boys playing with the ipad without the case on. I was not super impressed with the Words game and the drawing app. The Word game involved a lot of guessing and it seemed so random what pictures and words they had. My son who is learning how to read was just confused and my older son who can read was easily bored by it. What would make this so much better to me was if they worked together with some sort of phonics curriculum – I can imagine how powerful this would be to work in conjunction with an app similar to Teach Your Monster to Read where it’s teaching the different letter sounds and how to build words. The drawing app was okay (one of my boys enjoyed playing it once). But I didn’t love that it just involved staring at the screen, and didn’t involve a ton of creativity. 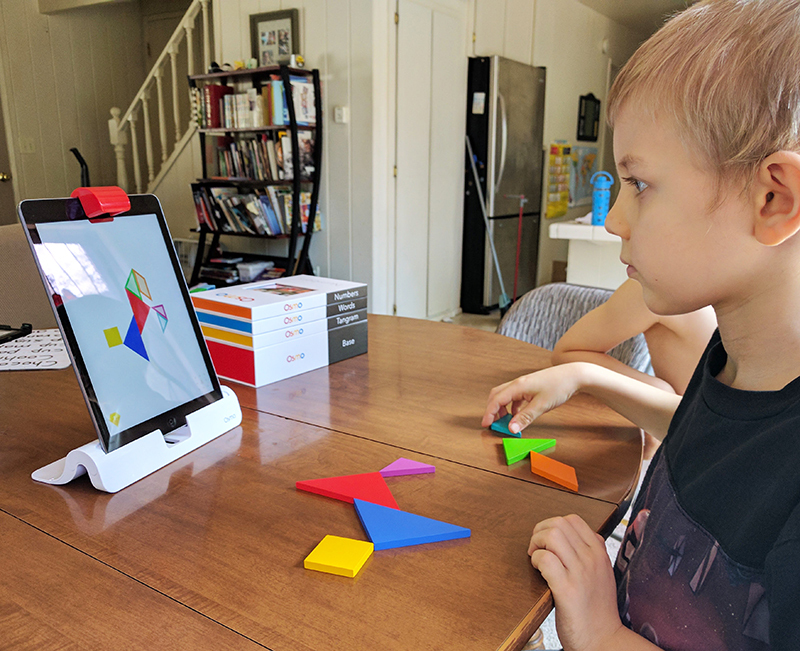 Overall, we’re enjoying the Osmo and I like that we’ve been able to build it into our homeschool routine. If you get the Osmo, you’ll need to get the base Osmo kit. Access to the other apps that don’t require extra pieces – like the Drawing app and the Newton app. I highly recommend the Coding Awbie Game. While we loved some of the other Osmo apps, this was by far the favorite and makes the whole system a pretty powerful (and fun!) tool for kids. Should you get the Osmo? 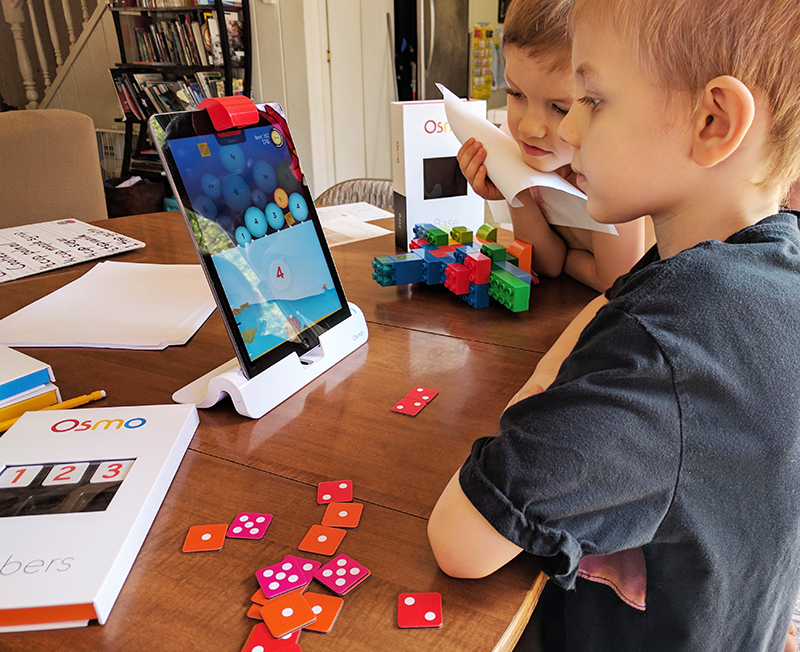 If your child is three or under, you may want to wait until they are older to get something like the Osmo. It’s designed for kindergarten and up. If you’re looking for something that is a complete curriculum in a subject, then the Osmo probably isn’t a great fit for you. It’s more of a educational supplement. And if money is super tight for you, spending $100+ on a game system (even an educational one) may not be a great idea. 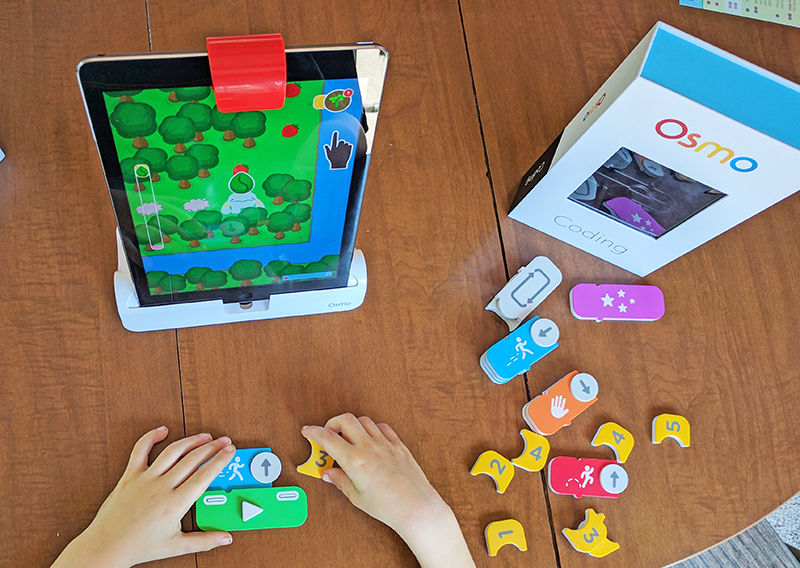 But, if you’re looking for a interactive educational tool to build some fun into your child’s or student’s education and you don’t mind investing in something durable (and that’s a huge step up from the generic educational apps you find in the app store), then I think the Osmo is absolutely worth buying.